More of a Tradition than an invention. 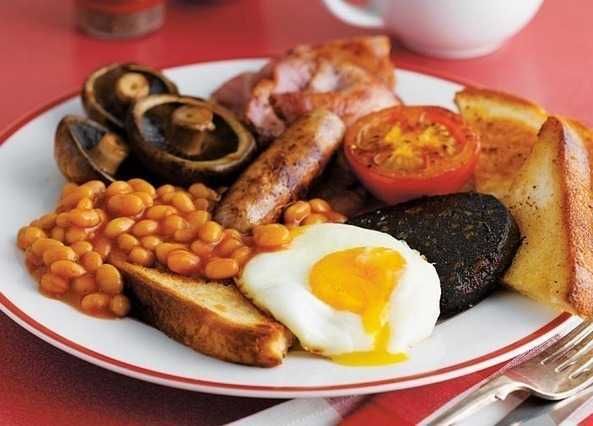 But this Food item, aka the Fry Up, is very British and very popular and has regional variations. The full breakfast is a centuries old British breakfast tradition dating back at least to the 1300's, just about when the British said goodbye to the French, 'Au Revoir'. All served with a mug of tea and Brown sauce. Sometimes 'Bubble and squeak' or hash browns. Brecwast Cymreig llawn. May include a sea influence of laverbread or cockles. Will have square sausage, tattie scone and clootie pudding (yum!). Fried potato farl, boxty or soda bread.